We'd long believed that we knew where to find all the diamond-shaped Blaw-Knox towers still standing - the two giants at WLW in Cincinnati and WSM in Nashville, the three-tower array (two of them reconstructed after a 1980s hurricane) at WBT in Charlotte and the smaller versions at WFEA in Manchester and WBNS in Columbus. Add to that the now-gone Blaw-Knoxes at WADO New York, the old WABC in Wayne, N.J., WCAU's site in Newtown Square, Pennsylvania and WHO in Des Moines, and that's all the diamond towers that ever stood - right? Then we got an e-mail from Paul Shinn, chief engineer for most of the stations in Stockton, California, telling us that he had an actual Blaw-Knox diamond still in use at KSTN (1420), which was about all the prodding we needed to make Stockton a stop on our next trip to northern California - and are we ever glad we did! There it is, out there at the end of Ralph Avenue, southeast of downtown, behind the studio and the two larger towers: all 162 feet of KSTN's tower 3, which is used only in the station's 5 kilowatt day operation (at night, it's 1 kW into the two big towers), a pedigreed Blaw-Knox, complete with the original blueprints still on file in the building. As neat as the little Blaw-Knox is, it's only one part of the overall historic experience to be had among Stockton's AM stations. 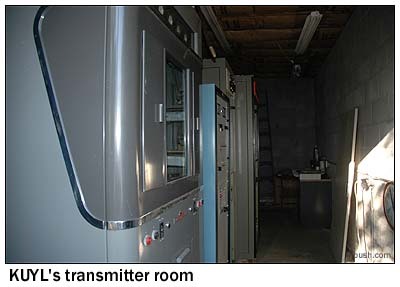 It's got a great cluster of transmitters in the back room, too, including the beautiful vintage Collins shown at left and below. 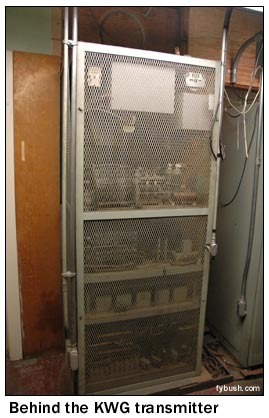 There's also a Bauer 707, of much newer vintage - but the Bauer's the auxiliary transmitter. 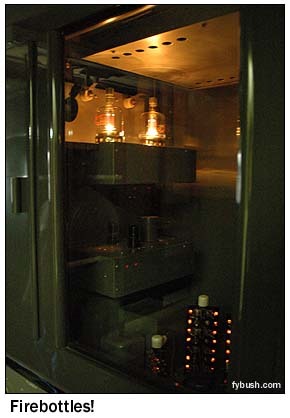 The old Collins still serves primary duty, and it looks (and sounds) absolutely great doing it, with those tubes glowing in time with the music. 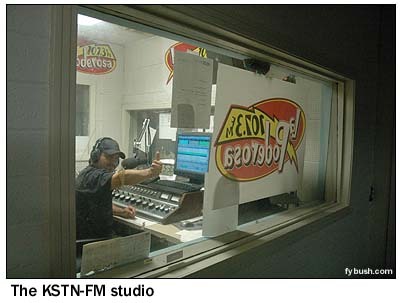 The building also houses KSTN-FM on 107.3, which was one of the first Spanish-language outlets in the region. 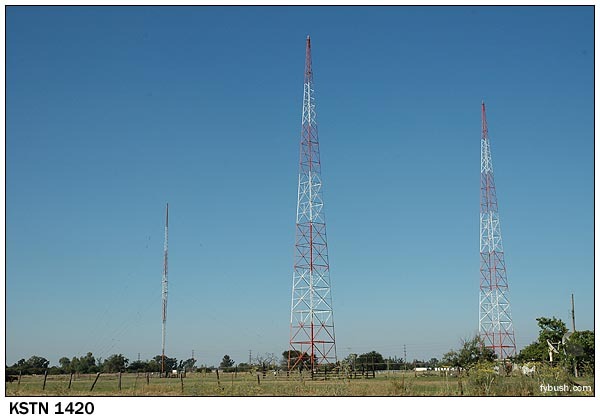 Today, "La Poderosa" is a radio monster, with a grandfathered superpower class B signal that reaches from Sacramento down beyond Modesto, and east into the Bay Area. But KSTN, for all its history, is only one of three AMs licensed to Stockton, and lucky for us, Paul also handles engineering duties for the others. Stockton's home to one of those three-letter calls that date from the earliest days of radio, and that facility is our next stop. 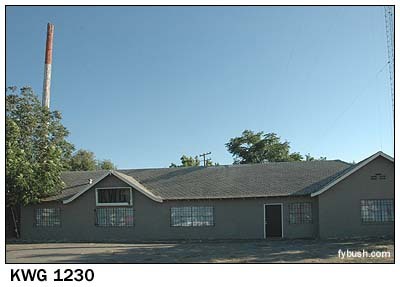 KWG (1230) was licensed December 7, 1921, and it's called 2286 W. Weber Avenue home since at least 1930. 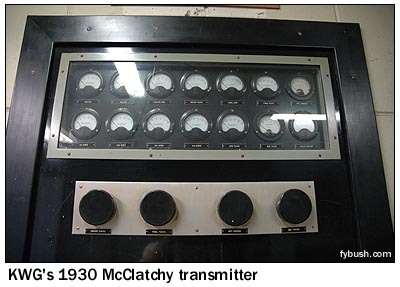 That's when the engineers from McClatchy Broadcasting, which also owned KFBK up in Sacramento and KMJ down in Fresno, built (from scratch) the transmitter that still sits in the Weber Avenue building, one room over from the studio where live bands once played late into the night. 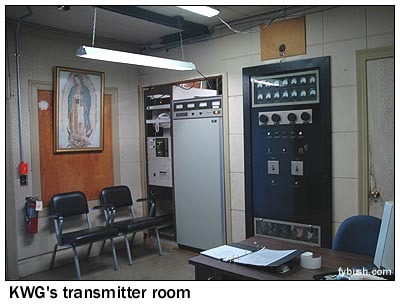 At the time - and indeed, until just a decade or so ago - the transmitter's output went right out the top, through a hole in the roof, and right up to a wire "T" antenna that stretched between two tall telephone poles mounted on each end of the building. The poles were replaced by a conventional vertical radiator in the nineties, but you can still see the stubs of each (painted red and white, no less) - one's visible at the left in the exterior photo above, and you can just see the replacement tower at the extreme right, too. The old McClatchy was eventually replaced (after a very long run) with a Harris MW1, and that in turn has been relegated to auxiliary duty as well. 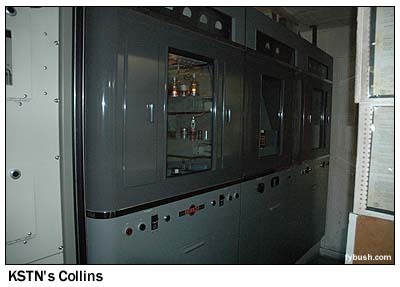 What would the old McClatchy engineers make of the solid-state BE AM1 that now occupies just a couple of feet of rack space at the left of transmitter row? One more site finishes off our Stockton AM tour, and it's off to the east of town. KUYL (1280) used to be KJAY, then KJAX. 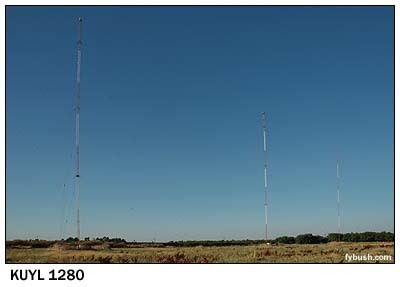 Today, it's owned by Clear Channel and plays automated oldies - and inside the transmitter building, we find the current main (a Nautel, seen at the center of the picture above), as well as another vintage Collins (at left) and an old Sparta Bauer (in the shadows at right). Many thanks to Paul Shinn for a great tour! THE HOLIDAYS ARE COMING - have you ordered the 2006 Tower Site Calendar! Click here for ordering information!